It was a rumor, and now its official. Samsung will be revealing its ‘mini’ Galaxy SIII today in Germany for those who think the 4.8 inch smartphone is too big. Unlike Apple, Samsung have chosen to reduce the size from 4.8′ to 4′ which would possibly attract a lot of customers. Not everyone has a huge palm to hold this huge phone. Now, it will be much easier to hold and talk with your loved ones for a longer period of time. Most importantly, it will fit the pockets with no hassle. Walking with the 4.8′ SIII was troublesome for many. According to the Telegraph, JK Shin, Head of Samsung Mobile, confirmed in a press conference held in Seoul that the SIII mini will be launched in Germany today. The immense popularity of 4 inch devices in Europe is what inspired them to produce this mini model. Here’s how the mini SIII will look. 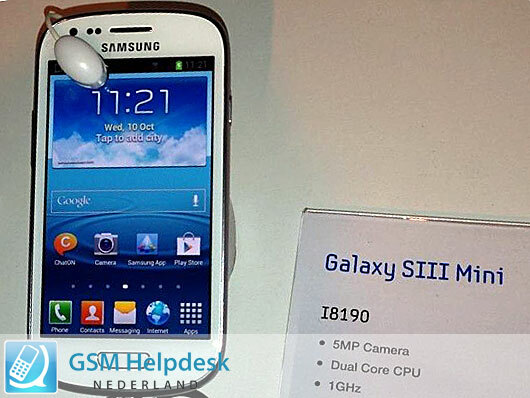 Seems like GSMHelpDesk from Netherlands have received the first picture before the official launch ! Pretty much the same thing as the popular flagship device but just the reduced size and of course the specs. Not sure yet. Have to wait for the event to take place where the prices will be confirmed. For now, all we have to do is wait for the event where all the information will be officially declared. Android phones are good but prices are bit high. Symphony is cheaper I think. Samsung’s releases are good also. Such a great news from Samsung. I cannot wait to have the new Samsung phone. Thanks for sharing the confirmation.